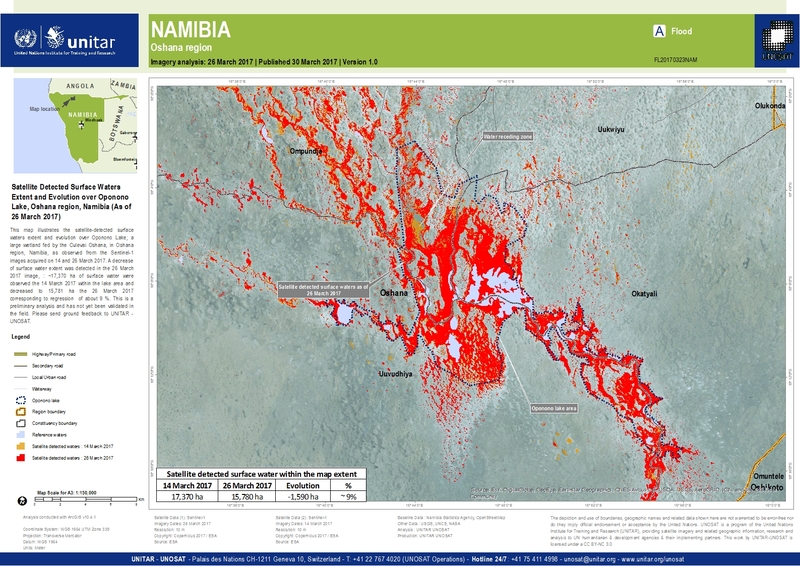 This map illustrates the satellite-detected surface waters extent and evolution over Oponono Lake; a large wetland fed by the Culevai Oshana, in Oshana region, Namibia, as observed from the Sentinel-1 images acquired on 14 and 26 March 2017. A decrease of surface water extent was detected in the 26 March 2017 image, : ~17,370 ha of surface water were observed the 14 March 2017 within the lake area and decreased to 15,781 ha the 26 March 2017 corresponding to regression of about 9 %. This is a preliminary analysis and has not yet been validated in the field. Please send ground feedback to UNITAR - UNOSAT.